FIG. 12.--Helmschau or Helmet-Show. (From Konrad Grünenberg's Wappencodex zu München.) End of fifteenth century. THE Crown is the Fountain of Honour, having supreme control of coat-armour. This control in all civilised countries is one of the appanages of sovereignty, but from an early period much of the actual control has been delegated to the Heralds and Kings of Arms. The word Herald is derived from the Anglo-Saxon--here, an army, and wald, strength or sway--though it has probably come to us from the German word Herold. 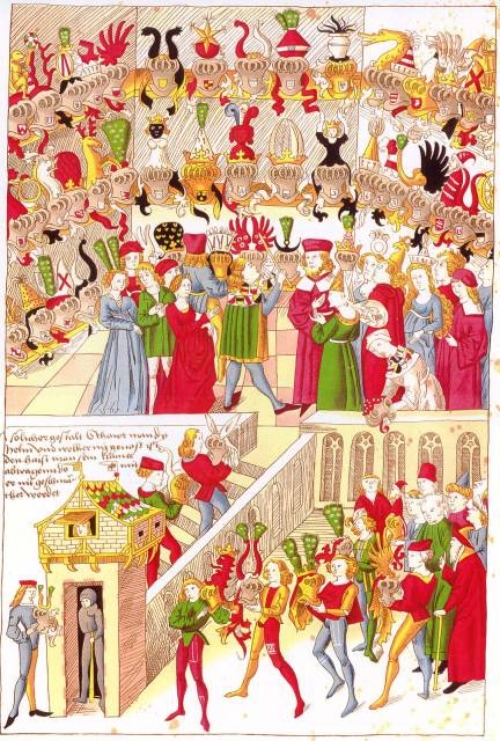 In the last years of the twelfth century there appeared at festal gatherings persons mostly habited in richly coloured clothing, who delivered invitations to the guests, and, side by side with the stewards, superintended the festivities. Many of them were minstrels, who, after tournaments or battle, extolled the deeds of the victors. These individuals were known in Germany as Garzune. Originally every powerful leader had his own herald, and the dual character of minstrel and messenger led the herald to recount the deeds of his master, and, as a natural consequence, of his master's ancestors. In token of their office they wore the coats of arms of the leaders they served; and the original status of a herald was that of a non-combatant messenger. When tournaments came into vogue it was natural that some one should examine the arms of those taking part, and from this the duties of the herald came to include a knowledge of coat-armour. As the Sovereign assumed or arrogated the control of arms, the right to grant arms, and the right of judgment in disputes concerning arms, it was but the natural result that the personal heralds of the Sovereign should be required to have a knowledge of the arms of his principal subjects, and should obtain something in the nature of a cognisance or control and jurisdiction over those arms; for doubtless the actions of the Sovereign would often depend upon the knowledge of his heralds. The process of development in this country will be more easily understood when it is remembered that the Marshal or Earl Marshal was in former times, with the Lord High Constable, the first in military rank under the King, who usually led his army in person, and to the Marshal was deputed the ordering and arrangement of the various bodies of troops, regiments, bands of retainers, &c., which ordering was at first facilitated and at length entirely determined by the use of various pictorial ensigns, such as standards, banners, crests, cognisances, and badges. The due arrangement and knowledge of these various ensigns became first the necessary study and then the ordinary duty of these officers of the Marshal, and their possession of such knowledge, which soon in due course had to be written down and tabulated, secured to them an important part in mediæval life. The result was that at an early period we find them employed in semidiplomatic missions, such as carrying on negotiations between contending armies on the field, bearing declarations of war, challenges from one sovereign to another, besides arranging the ceremonial not only of battles and tournaments, but also of coronations, Royal baptisms, marriages, and funerals. From the fact that neither King of Arms nor Herald is mentioned as officiating in the celebrated Scrope and Grosvenor case, of which very full particulars have come down to us, it is evident that the control of arms had not passed either in fact or in theory from the Crown to the officers of arms at that date. Konrad Grünenberg, in his Wappencodex ("Roll of Arms"), the date of which is 1483, gives a representation of a helmschau (literally helmet-show), here reproduced(Fig. 12), which includes the figure of a herald. Long before that date, however, the position of a herald in England was well defined, for we find that on January 5, 1420, the King appointed William Bruges to be Garter King of Arms. It is usually considered in England that it would be found that in Germany armory reached its highest point of evolution. Certainly German heraldic art is in advance of our own, and it is curious to read in the latest and one of the best of German heraldic books that "from the very earliest times heraldry was carried to a higher degree of perfection and thoroughness in England than elsewhere, and that it has maintained itself at the same level until the present day. In other countries, for the most part, heralds no longer have any existence but in name." The initial figure which appears at the commencement of Chapter I. represents John Smert, Garter King of Arms, and is taken from the grant of arms issued by him to the Tallow Chandlers' Company of London, which is dated September 24, 1456. Long before there was any College of Arms, the Marshal, afterwards the Earl Marshal, had been appointed. The Earl Marshal is now head of the College of Arms, and to him has been delegated the whole of the control both of armory and of the College, with the exception of that part which the Crown has retained in its own hands. After the Earl Marshal come the Kings of Arms, the Heralds of Arms, and the Pursuivants of Arms. The title of King of Arms, or, as it was more anciently written, King of Heralds, was no doubt originally given to the chief or principal officer, who presided over the heralds of a kingdom, or some principal province, which heraldic writers formerly termed marches; or else the title was conferred upon the officer of arms attendant upon some particular order of knighthood. Garter King of Arms, who is immediately attached to that illustrious order, is likewise Principal King of Arms, and these, although separate and distinct offices, are and have been always united in one person. Upon the revival and new modelling of the Order of the Bath, in the reign of George the First, a King of Arms was created and attached to it, by the title of Bath King of Arms; and King George III., upon the institution of the Hanoverian Guelphic Order of Knighthood, annexed to that order a King of Arms, by the appellation of Hanover. At the time of the creation of his office, Bath King of Arms was given Wales as his province, the intention being that he should rank with the others, granting arms in his own province, but he was not, nor was Hanover, nor is the King of Arms of the Order of St. Michael and St. George, a member (as such) of the corporation of the College of Arms. The members of that corporation considered that the gift of the province of Wales, the jurisdiction over which they had previously possessed, to Bath King was an infringement of their chartered privileges. The dispute was referred to the law officers of the Crown, whose opinion was in favour of the corporate body. Berry in his Encyclopœdia Heraldica further remarks: "The Kings of Arms of the provincial territories have the titles of Clarenceux and Norroy, the jurisdiction of the former extending over the south, east, and west parts of England, from the river Trent southwards; and that of the latter, the remaining part of the kingdom northward of that river. Kings of Arms have been likewise assigned other provinces over different kingdoms and dominions, and besides Ulster King of Arms for Ireland, and Lyon King of Arms for Scotland, others were nominated for particular provinces abroad, when united to the Crown of England, such as Aquitaine, Anjou, and Guyenne, who were perhaps at their first creation intended only for the services of the places whose titles they bore, when the same should be entirely subdued to allegiance to the Crown of England, and who, till that time, might have had other provinces allotted to them, either provisionally or temporarily, within the realm of England. There were also other Kings of Arms, denominated from the dukedoms or earldoms which our princes enjoyed before they came to the throne, as Lancaster, Gloucester, Richmond, and Leicester, the three first having marches, or provinces, and the latter a similar jurisdiction. Windsor, likewise, was a local title, but it is doubtful whether that officer was ever a King of Arms. Marche also assumed that appellation, from his provincial jurisdiction over a territory so called. But although anciently there were at different periods several Kings of Arms in England, only two provincial Kings of Arms have, for some ages, been continued in office, viz. Clarenceux and Norroy, whose provinces or marches are, as before observed, separated by the river Trent, the ancient limits of the escheaters, when there are only two in the kingdom, and the jurisdiction of the wardens of the forests. Norroy is considered the most ancient title, being the only one in England taken from the local situation of his province, unless Marche should be derived from the same cause. The title of Norroy was anciently written Norreys and Norreis, King of Arms of the people residing in the north; Garter being styled Roy des Anglois, of the people, and not d'Angleterre, of the kingdom, the inhabitants of the north being called Norreys *1, as we are informed by ancient historians. With horse and harneis at Carlele, made samning." See Langtoft's Chronicle treating of the Wars of Edward I. against the Scots. Throgh Spring of Norreis men that were certeyn." Ibid., Australes se Norensibus opposuerunt. M. Oaris, under the year 1237. It appears that there was a King of Arms for the parts or people on the north of Trent as early as the reign of Edward I., from which, as Sir Henry Spelman observes, it may be inferred that the southern, eastern, and western parts had principal heralds, or Kings of Arms, although their titles at that early age cannot now be ascertained. Norroy had not the title of King till after the reign of Edward II. It was appropriated to a King of Heralds, expressly called Rex Norroy, Roy d'Armes del North, Rex Armorum del North, Rex de North, and Rex Norroy du North; and the term Roy Norreys likewise occurs in the Pell Rolls of the 22nd Edward III. ; but from that time till the 9th of Richard II. no farther mention is made of any such officer, from which it is probable a different person enjoyed the office by some other title during that interval, particularly as the office was actually executed by other Kings of Arms, immediately after that period. John Otharlake, Marche King of Arms, executed it in the 9th of Richard II., Richard del Brugg, Lancaster King of Arms, 1st Henry IV., and Ashwell, Boys, and Tindal, successively Lancaster Kings of Arms, until the end of that monarch's reign. Edward IV. replaced this province under a King of Arms, and revived the dormant title of Norroy. But in the Statute of Resumptions, made 1st Henry VII., a clause was inserted that the same should not extend to John Moore, otherwise Norroy, chief Herald King of Arms of the north parts of this realm of England, so appointed by King Edward IV. by his Letters Patent, bearing date 9th July, in the eighteenth year of his reign. It has since continued without interruption. Falcon King of Arms seems the next who had the title of King conferred upon him, and was so named from one of the Royal badges of King Edward III., and it was afterwards given to a herald and pursuivant, under princes who bore the falcon as a badge or cognisance, and it is difficult to ascertain whether this officer was considered a king, herald, or pursuivant. Froissart in 1395 calls Faucon only a herald, and in 1364 mentions this officer as a King of Arms belonging to the King of England; but it is certain that in the 18th Richard II. there was a King of Arms by that appellation, and so continued until the reign of Richard III., if not later; but at what particular period of time the officer was discontinued cannot be correctly ascertained. Windsor has been considered by some writers to have been the title of a King of Arms, from an abbreviation in some old records, which might be otherwise translated. There is, however, amongst the Protections in the Tower of London, one granted in the 49th Edward III. to Stephen de Windesore, Heraldo Armorum rege dicto, which seems to favour the conjecture, and other records might be quoted for and against this supposition, which might have arisen through mistake in the entries, as they contradict one another. Marche seems the next in point of antiquity of creation. ; but although Sir Henry Spelman says that King Edward IV. descended from the Earls of Marche, promoted Marche Herald to be a King of Arms, giving him, perhaps, the marches for his province, it is pretty clearly ascertained that it was of a more early date, from the express mention of March Rex Heraldorum and March Rex Heraldus in records of the time of Richard II., though it may be possible that it was then only a nominal title, and did not become a real one till the reign of Edward IV., as mentioned by Spelman. Lancaster King of Arms was, as the same author informs us, so created by Henry IV. in relation to his own descent from the Lancastrian family, and the county of Lancaster assigned to him as his province; but Edmondson contends "that that monarch superadded the title of Lancaster to that of Norroy, or King of the North, having, as it may be reasonably conjectured, given this province north of Trent, within which district Lancaster was situated, to him who had been formerly his officer of arms, by the title of that dukedom, and who might, according to custom, in some instances of former ages, retain his former title and surname of heraldship, styling himself Lancaster Roy d'Armes del North." Leicester King of Arms was a title similar to that of Lancaster, and likewise a creation to the same Sovereign, Henry IV., who was also Earl of Leicester before he assumed the crown, and was given to a person who was before that time a herald. It appears that Henry Grene was Leicester Herald, 9th King Richard II., and in the 13th of the same reign is called a Herald of the Duke of Guyen and Lancaster, but prior to the coronation of Henry IV. he was certainly a King of Heralds, and so styled in a privy seal date dantecedent to that ceremony. A similar instrument of the tenth year of that monarch's reign also mentions Henry Grene, otherwise Leicester King of Arms. As it is evident that, during the reign of Henry IV., Lancaster King of Arms has under that title the province of the north, Mr. Edmondson, with good reason, supposes that the southern province, or part of that which is now under Clarenceux, might at that time be under this Leicester, especially as the title of Clarenceux was not in being till after the 3rd of Henry V., when, or soon after, the title of Leicester might have become extinct by the death of that officer; for although Leicester King of Arms went over into France with Henry V. in the third year of his reign, yet he is not mentioned in the constitutions made by the heralds at Roan in the year 1419-20. Clarenceux, the next King of Arms in point of creation, is a title generally supposed to have been taken from Clare, in Suffolk, the castle at that place being the principal residence of the ancient Earls of Hereford, who were, from thence, though very improperly, called Earls of Clare, in the same manner as the Earls of Pembroke were often named Earls of Strigoil and Chepstow; the Earl of Hampshire, Earl of Winchester; the Earl of Derby, Earl of Tuttebury; the Earl of Sussex, Earl of Chichester, &c. King Edward III. created his third son Lionel Duke of Clarence, instead of the monosyllable Clare (from his marriage with the granddaughter of the late Earl), but Lionel dying without issue male, Henry IV. created his younger son Thomas Duke of Clarence, who being slain without issue 9th of Henry V., the honour remained in the Crown, until King Edward IV. conferred it upon his own brother. Mr. Sandford tells us that Clarence is the country about the town, castle, and honour of Clare, from which duchy the name of Clarenceux King of Arms is derived. Spelman, however, contends that it is a mistake in attributing the institution of Clarenceux to King Edward IV. after the honour of Clarence devolved as an escheat to the Crown upon the untimely death of his brother George, as he found William Horsely called by this title in the reign of Henry V. and also Roger Lygh, under King Henry VI. ; and it is conjectured that the office of Clarenceux King of Arms is not more ancient than the reign of Edward III. Gloucester Herald, frequently mentioned by historians, was originally the herald of the great Humphry, Duke of Gloucester, of whom mention is made upon record in the 10th of Henry VI. ; and Richard, brother to Edward IV., who was created Duke of Gloucester, is said to have had a herald by that title during the reign of his brother, and who was attendant as such at the funeral of that monarch. In a manuscript in the Ashmolean collection, it is stated that Richard Champnay attended as Gloucester King of Arms at the coronation of Richard III. upon the 7th July following his usurpation of the crown; but it appears by more authentic record that this Richard Champnay was, by the style and title of Herald of Arms, on the 18th September, in the first year of his usurpation, by patent created a King of Arms and Principal Herald of the parts of Wales, by the style and title of Gloucester, giving him licence and authority to execute all and singular that by law or custom in former times belonged to the office of King of Arms. It is supposed that the office ceased upon his death, which in all probability took place before that of the usurper. Richmond King of Arms.--A herald called Richmond is frequently mentioned, as well belonging to the Crown as of the nobility. But the records of the reign of King Henry VII., who had before his elevation to the throne been Earl of Richmond, contain many entries of Richmond King of Arms; but although somewhat vague in the description, sufficiently bear out the conjecture that Henry VII., previous to his coronation, created a new King of Arms by the title of Richmond, although no regular patent of creation has ever been found. Sir Henry Spelman informs us that, in addition to the two Kings of Arms for the two Heraldic provinces bounded north and south by the river Trent, there were also two provincial kings for the dominions of our Sovereign in France, styled Guyenne and Agincourt (omitting Aquitaine and Anjou, which were certainly in being at the same time), and another for Ireland by that name, altered by King Edward VI. into Ulster. Ireland King of Arms first occurs upon record 6th Richard II., anno 1482, mentioned by Froissart, where he is called Chandos le Roy d'Ireland. A regular succession of officers, by the title of Ireland King of Arms, continued from that time till the reign of King Edward IV., but from the death of that monarch till the creation of Ulster by Edward VI. it is uncertain whether the title existed, or what became of the office. Edward VI. altered the title of Ireland King of Arms into that of Ulster, or rather considered it as a new institution, from the words of his journal: "Feb. 2. There was a King of Arms made for Ireland, whose name was Ulster, and his province was all Ireland; and he was the fourth King of Arms, and the first Herald of Ireland." The patent passed under the Great Seal of England. Guyenne, a part of Aquitaine, in France, a province belonging to the British Crown, gave title not only to a King of Arms, but to a herald likewise, and Sir Henry Spelman dates its creation in the time of Edward I., although it is somewhat doubtful, and thought to be in the reign of Edward III. Guyenne Herald appears upon record during the reign of Henry VI., and though Kings of Arms were frequently styled heralds in old records, it is more than probable both offices were in existence at the same time. From the time of Edward IV. no such officers belonging to the Crown of England seem to have been continued, and it is doubtful whether they ever held in constant succession from their first creation. Aquitaine, which included what were afterwards called Guyenne, Xantoigne, Gascoigne, and some islands, gave title to a King of Heralds as early as the reign of Edward III., and it is conjectured to have been an officer belonging to the Black Prince, who had the principality of Aquitaine given to him by his father; but although this officer is mentioned in the reign of Richard II. and 3rd of Henry V., no record occurs after the latter period. Agincourt was also a title conferred upon a herald, in memory of that signal victory; and lands were granted to him for life, 6th Henry V., as mentioned by Sir Henry Spelman; but whether the office was continued, or any particular province assigned to this officer, cannot be ascertained. Anjou King of Arms was likewise an officer of King Henry VI., and attendant upon John, Duke of Bedford, when Regent of France, who assumed the title of Duke of Anjou. But upon the death of the Duke of Bedford, this officer was promoted to Lancaster King of Arms; and in all probability the title of Anjou, as a King of Heralds, was discontinued. Volant also occurs upon record in the 28th Edward III., and Vaillant, le Roy Vaillant Heraud, and le Roy Vailland, are likewise mentioned in 1395. Henry V. instituted the office of Garter King of Arms; but at what particular period is rather uncertain, although Mr. Anstis has clearly proved that it must have taken place after the 22nd May, and before the 3rd September, in the year 1417. Stephen Martin Leake, Esq., who filled the office, sums up its duties in the following words: "Garter was instituted by King Henry V., A.D. 1417, for the service of the Most Noble Order of the Garter, which was made sovereign within the office of arms over all other officers, subject to the Crown of England, by the name of Garter King of Arms of England. In this patent he is styled Principal King of English Arms, and Principal Officer of Arms of the Most Noble Order of the Garter, and has power to execute the said office by himself or deputy, being an herald. By the constitution of his office, he must be a native of England, and a gentleman bearing arms. To him belongs the correction of arms, and all ensigns of honour, usurped or borne unjustly, and also to grant arms to deserving persons, and supporters to the nobility and Knights of the Bath; to go next before the sword in solemn proceeding, none interposing, except the constable and marshal; to administer the oath to all the officers of arms; to have a habit like the registrar of the order; baron's service in the court; lodgings in Windsor Castle; to bear his white rod with a banner of the ensigns of the order thereon before the Sovereign; also when any lord shall enter the Parliament chamber, to assign him his place, according to his dignity and degree; to carry the ensign of the order to foreign princes, and to do, or procure to be done, what the Sovereign shall enjoin, relating to the order; with other duties incident to his office of principal King of Arms, for the execution whereof he hath a salary of one hundred pounds a year, payable at the Exchequer, and an hundred pounds more out of the revenue of the order, besides fees." Bath King of Arms was created 11th George I., in conformity with the statutes established by His Majesty for the government of the Order of the Bath, and in obedience to those statutes was nominated and created by the Great Master of the Order denominated Bath, and in Latin, Rex armorum Honoratissimi Ordinis Militaris de Balneo. These statutes direct that this officer shall, in all the ceremonies of the order, be habited in a white mantle lined with red, having on the right shoulder the badge of the order, and under it a surcoat of white silk, lined and edged with red; that he shall wear on his breast, hanging to a golden chain about his neck, an escocheon of gold, enamelled with the arms of the order, impaling the arms of the Sovereign, crowned with the Imperial crown. That at all coronations he shall precede the companions of the order, and shall carry and wear his crown as other Kings of Arms are obliged to do. That the chain, escocheon, rod, and crown, shall be of the like materials, value, and weight, with those borne and used by Garter Principal King of Arms, and of the like fashion, the before specified variations only excepted: and that besides the duties required of him in the several other articles of the statutes, he shall diligently perform whatever the Sovereign or Great Master shall further command. On the 14th January 1725, His Majesty was further pleased by his Royal sign-manual, to erect, make, constitute, and ordain the then Bath King of Arms, Gloucester King of Arms, and principal Herald of the parts of Wales, and to direct letters patent to be made out and pass the Great Seal, empowering him to grant arms and crests to persons residing within the dominions of Wales, either jointly with Garter, or singly by himself, with the consent and at the pleasure of the Earl Marshal, or his deputy for the time being, and for the future that the office of Gloucester should be inseparably annexed, united, and perpetually consolidated with the office of Bath King of Arms, of the Most Honourable Military Order of the Bath, and Gloucester King of Arms, and principal Herald of the parts of Wales. And also that he, for the dignity of the order, should in all assemblies and at all times have and take place and precedency above and before all other provincial Kings of Arms whatsoever." This armorial jurisdiction, however, was subsequently, as has been previously explained, annulled. Concerning the heralds Berry remarks: "In former ages, when honour and chivalry were at their height, these officers were held in great estimation, as appears by the ceremonies which attended their creations, which was by the Sovereign himself or by special commission from him, and, according to Gerard Leigh, was after the following manner: The King asked the person to be so created whether he were a gentleman of blood or of second coat-armour; if he was not, the King gave him lands and fees, and assigned him and his heirs proper arms. Then, as the messenger was brought in by the herald of the province, so the pursuivant was brought in by the eldest herald, who, at the prince's command, performed all the ceremonies, as turning the coat of arms, setting the manacles thereof on the arms of the pursuivant, and putting about his neck the collar of SS, and when he was named, the prince himself took the cup from the herald, which was gilt, and poured the water and wine upon the head of the pursuivant, creating him by the name of our herald, and the King, when the oath was administered, gave the same cup to the new herald. Upton sums up the business of a herald thus: That it was their office to create under officers, to number the people, to commence treaties of matrimony and of peace between princes, to visit kingdoms and regions, and to be present at martial exploits, &c., and they were to wear a coat of their master's arms, wearing the same in conflicts and tournaments, in riding through foreign countries, and at all great entertainments, coronations of kings and queens, and the solemnities of princes, dukes, and other great lords. In the time of King Richard II. there belonged to the King of Arms and heralds the following fees, viz. : at the coronation of the King, a bounty of £100; when the King first displayed his banners, 100 marks; when the King's son was made a knight, 40 marks; when the prince and a duke first display their banners, £20; if it be a marquis, 20 marks; if an earl, £10; if a baron, 5 marks of silver crowns, of 15 nobles; and if a knight bachelor, newly made a banneret, 3 marks, or 10 nobles; when the King is married, the said Kings of Arms and heralds to have £50; when the Queen has a child christened, a largess at the Queen's pleasure, or of the lords of the council, which was sometimes £100, and at others 100 marks, more or less; and when she is churched, such another largess; when princesses, duchesses, marchionesses, countesses, and baronesses have a child christened, and when they are churched, a largess suitable to their quality and pleasure; as often as the King wears his crown, or holds Royal state, especially at the four great festivals of Christmas, Easter, Whitsuntide, and All Saints, to every one of the three Kings of Arms present when the King goes to the chapel to mass, a largess at the King's pleasure; when a maiden princess, or daughter of a duke, marquis, earl, or baron is married, there belongs to the said Kings of Arms, if present, the upper garment she is married in; if there be a combat within lists, there belong to the Kings of Arms, if present, and if not to the other heralds present, their pavilions; and if one of the combatants is vanquished, the Kings of Arms and heralds who are present shall have all the accoutrements of the person so vanquished, and all other armour that falls to the ground; when subjects rebel, and fortify any camp or place, and afterwards quit the same, and fly, without a battle, there appertain to the said Kings of Arms and heralds who are present all the carts, carriages, and tools left behind; and, at New Year's Tide, all the noblemen and knights of the court used to give the heralds New Year's gifts. Besides the King's heralds, in former times, divers noblemen had heralds and pursuivants, who went with their lords, with the King's heralds, when attending the King. The fees of the King's heralds and pursuivants of arms have since varied, and, besides fees upon creations of peers, baronets, and knights, they have still donations for attendance at court upon the festivals of Christmas, Easter, Whitsuntide, All Saints, and St. George's Day; fees upon installation of Knights of the Garter and Bath, Royal marriages, funerals, public solemnities, &c., with small salaries paid from the Exchequer; but their ancient fees from the nobility, upon certain occasions, have been long discontinued, and their principal emolument arises from grants of arms, the tracing of genealogies, and recording the same in the Registers of the College of Arms." Windsor Herald, which title was instituted 38th of Edward III., when that monarch was in France. Chester Herald, instituted in the same reign. Richmond Herald, instituted by King Edward IV. Somerset Herald, instituted by King Henry VIII. about the time when that monarch created his son Henry Fitzroy Duke of Somerset. York Herald, instituted by King Edward III. in honour of his son, whom he created Duke of York. Lancaster Herald, also instituted by Edward III. when he created his son Duke of Lancaster. The heralds were first incorporated as a college by Richard III. They were styled the Corporation of Kings, Heralds, and Pursuivants of Arms. FIG. 13.--Officers of Arms as represented in the famous Tournament Roll of Henry VIII., now preserved in the College of Arms. Concerning Pursuivants of Arms, Berry remarks that these officers, who are the lowest in degree amongst officers of arms, "were, as the name implies, followers, marshals, or messengers attendant upon the heralds. Pursuivants were formerly created by the nobility (who had, likewise, heralds of arms) with great ceremony in the following manner. One of the heralds, wearing his master's coat, leading the person to be created pursuivant by the left hand, and holding a cup full of wine and water in his right, came into the presence of the lord and master of him who was to be created, and of whom the herald asked by what name he would have his pursuivant called, which the lord having mentioned, the herald then poured part of the wine and water upon his head, calling him by the name so assigned to him. The herald then took the coat of his lord, and put it over his head athwart, so that part of the coat made for the arms before and behind, and the longer part of it on both sides of the arms of the person created, and in which way the pursuivant was always to wear it. This done, an oath of fidelity was administered to the new-made pursuivant, and the ceremony concluded." This curious method of the wearing of the tabard by a pursuivant has long since been discontinued, if indeed it was ever generally adopted, a point on which I have by no means been able to satisfy myself. Rouge-Croix, the first in point of antiquity of creation, is so styled from the red cross of St. George, the Patron Saint of England. Blue-Mantle, so called by King Edward III., in honour of the French coat which he assumed, being blue. Portcullis, also instituted by Henry VII., and so named from that badge, or cognisance, used by him. The duties of a pursuivant are similar to those of a herald; he assists in all public processions, or ceremonies, such as Royal marriages, funerals, installations, &c., and has certain fees for attendance upon such occasions. Pursuivants likewise receive fees upon creations of peers, baronets, and knights, and also donations for attending court upon the principal festivals of Christmas, Easter, Whit-Sunday, All Saints, and St. George's Day, and a small salary payable out of the Exchequer. They wear a tabard of damask silk, embroidered with the Royal arms, like the heralds, but no collar of SS. Of the Heraldic Executive in Scotland, Lyon King of Arms (Sir James Balfour Paul), in his book "Heraldry in relation to Scottish History and Art," writes: "At one period the Lyon was solemnly crowned at his inauguration, and vested with his tabard and baton of office." The ceremony was a very elaborate one, and is fully described by Sir James Balfour in a MS., now in the Advocates' Library. There is also an account of the coronation of Sir Alexander Durham, when Laurie, the minister of the Tron Kirk, preached from the text, "What shall be done to the man whom the king delighteth to honour?" The crown was of gold, and exactly similar to the Imperial crown of Scotland, save that it had no jewels. Now the Lyon's crown is the same as the English King of Arms. The crown is only worn at Royal coronations. At that of Charles I. at Edinburgh in 1633, the Lyon carried thevessel containing the sacred oil. In addition to his strictly armorial appointment, the Lyon is also a King of Arms of the Most Ancient and Most Noble Order of the Thistle. Heralds and pursuivants formed an important part from very early times not only of the Royal Household, but also of those of the higher nobility, many of whom had private heralds. Of these officers there is a very full list given by Dr. Dickson in the preface to the Lord Treasurer's Accounts. Of heralds who were or ultimately became part of the King's Household we meet with Rothesay, Marchmont, Snowdon, Albany, Ross, and Islay; Ireland, Orkney, and Carrick are also mentioned as heralds, but it is doubtful whether the first and last were ever more than pursuivants. Of the latter class of officers the following were in the Royal establishment: Carrick, Bute, Dingwall, Kintyre, Ormonde, Unicorn; but we also find Aliszai or Alishay, Dragance, Diligens, Montrose, Falkland, Ireland, Darnaway, Garioch, Ettrick, Hales, Lindsay, Endure, Douglas, and Angus. Of the latter Garioch was created by James IV. for his brother John, Earl of Mar; Hailes in 1488, when Lord Hailes was made Earl of Bothwell; while Lindsay and Endure were both evidently attached to the Lindsay family, as were Douglas and Angus to the noblemen whose titles they bore. In 1403 Henry IV. of England granted a pursuivant under the title of Shrewsbury to George, Earl of March, for services rendered at the battle of that name, but we do not find that the office was continued. In Scotland heralds appear at an early date, though none are mentioned as attending the coronation of Alexander III. in 1249; nor is there any account of any such officers accompanying that sovereign when he did homage to Edward I. at Westminster in 1278. In the next century, however, armorial bearings were quite well known in Scotland, and there is an entry in the Exchequer Rolls on loth October 1337 of a payment of £32, 6s. Scots for the making of seventeen armorial banners, and in 1364 there is another to the heralds for services at the tournaments; while William Petilloch, herald, has a grant from David II. of three husbandlands in Bonjedward, and Allan Fawside gets a gift of the forfeited estate of one Coupland, a herald (temp. Edward Baliol). *1 The first mention of a herald, under his official designation, which I have met with in our records occurs in 1365, when there is a confirmation under the Great Seal by David II. of a charter by Dugal M'Dowille to John Trupour or Trumpour "nunc dicto Carric heraldo." Sir James Balfour tells us that the Lyon and his heralds attended the coronation of Robert II. at Holyrood on 23rd May 1371, but whether or not this is true--and I have not been able to verify it--it is certain that a Lyon Herald existed very shortly after that date, as in the Exchequer Rolls mention is made of the payment of a certain sum to such an officer in 1377; in 1379 Froissart says that a herald was sent by Robert II. to London to explain that the truce had been infringed without his will and against his knowledge, and on 8th April 1381 a warrant was issued in London for a licence to "Lion Heraud" of the King of Scots, authorising him to take away a complete suit of armour which he had bought in that city. It is not, however, till 1388 that we find Lyon accorded the Royal style. In that year a payment is made "Leoni regi heraldorum," but at the audit following the battle of Otterburn he is called defunctus, which suggests that he had been slain on that well-fought field. The Lyon appears in several embassies about this period both to England and France, and one Henry Greve, designed in the English Issue Rolls as "King of Scottish Heralds," was at the Tower of London in 1399, either at or immediately after the coronation of Henry IV. From 1391 onwards there is frequent mention of one Douglas, "Herald of the King," and in 1421 he is styled "Lyon Herald." *1 Robertson's Index to "Missing Charters." FIG. 14.--The velvet tabard of Sir William Dugdale, Garter King of Arms from 26th April 1677 to 10th February 1686. Of the German officers of arms they, like the English, are divided into three classes, known as Wappenkönige, Herolde, and Persevanten. These, like our own officers, had peculiar titles; for example Suchenwirt(an Austrian ducal herald), Lub-den Frumen (a Lichtenstein pursuivant), Jerusalem (a herald of the Limmer Palatinate), Romreich (an Imperial herald). About the middle of the sixteenth century, the official names of the heralds fell into disuse; they began to make use of their ancestral names with the title of Edel and Ehrenvest (noble and honourable), but this did not last long, and the heralds found themselves thrown back into the old ways, into which the knightly accoutrements had already wandered. The official dress of an officer of arms as such in Great Britain is merely his tabard (Figs. 13, 14, 15). This garment in style and shape has remained unchanged in this country from the earliest known period of which representations of officers of arms exist; but whilst the tabard itself has remained unaltered in its style, the arms thereupon have constantly changed, these always being the arms of the Sovereign for the time being. The costume worn with the tabard has naturally been subject to many changes, but it is doubtful if any attempt to regulate such costume was ever officially made prior to the reign of Queen Victoria. The tabard of a pursuivant is of damask silk; that of a herald, of satin; and that of a king of arms, of velvet. The initial letter on page 1 is a portrait of John Smert, Garter King of Arms, and is taken from the grant of arms to the Tallow Chandlers' Company, dated 24th September 1456. He is there represented as wearing beneath his tabard black breeches and coat, and a golden crown. But Fig. 15 is actually a representation of the first Garter King of Arms, William Bruges, appointed 5th January 1420. He is represented as carrying a white staff, a practice which has been recently revived, white wands being carried by all the heralds at the public funeral of the Right Hon. W. E. Gladstone. In Germany the wands of the heralds were later painted with the colours of the escutcheons of the Sovereign to whom they were attached. There was until recently no official hat for an officer of armsin England, and confirmation of this is to be found in the fact that Dallaway mentions a special licence to Wriothesley Garter giving him permission to wear a cap on account of his great age. Obviously, however, a tabard requires other clothing to be worn with it. The heralds in Scotland, until quite recently, when making public proclamations were content to appear in the ordinary elasticside boots and cloth trousers of everyday life. This gave way for a brief period, in which Court dress was worn below the tabard, but now, as in England, the recognised uniform of a member of the Royal Household is worn. In England, owing to the less frequent ceremonial appearances of the heralds, and the more scrupulous control which has been exercised, no such anachronisms as were perpetuated in Scotland have been tolerated, and it has been customary for the officers of arms to wear their uniform as members of the Sovereign's Household (in which uniform they attend the levees) beneath the tabard when making proclamations at the opening of Parliament or on similar occasions. At a coronation and at some other full State ceremonies they wear knee-breeches. At the late ceremony of the coronation of King Edward VII., a head-dress was designed for the officers of arms. These caps are of black velvet embroidered at the side with a rose, a thistle, or a harp, respectively for the English, Scottish, and Irish officers of arms. A great deal of confusion has arisen between the costume and the functions of a Herald and a Trumpeter, though the confusion has been confined to the minds of the uninitiated and the theatrical stage. The whole subject was very amusingly dealt with in the Genealogical Magazine in an article by Mr. G. Ambrose Lee, Bluemantle, and the illustrations which he gives of the relative dresses of the Heralds and the Trumpeters at different periods (see Figs. 16-19) are interesting. Briefly, the matter can be summed up in the statement that there never was a Trumpeter who made a proclamation, or wore a tabard, and there never was a Herald who blew a trumpet. The Trumpeters nearly always accompanied the Heralds to proclaim their presence and call attention to their proclamation. In France the Heralds were formed into an incorporation by Charles VI. in 1406, their head being Mountjoye, King of Arms, with ten heralds and pursuivants under him. It will be noticed that this incorporation is earlier than that of the College of Arms in England. FIG. 18.--A State Trumpeter and a Herald at the coronation of James I. The Revolution played havoc with the French Records, and no College of Arms now exists in France. But it is doubtful whether at any time it reached the dignity or authority which its English counterpart has enjoyed in former times. Fig. 20 represents a French Herald of the early part of the fifteenth century. It is taken from a representation of the Rally of the Parisians against King Charles VI. in 1413, to be found in a MS. edition of Froissart, formerly in the Royal Library at Paris. All the heralds and Kings of Arms (but not the pursuivants) wear the curious collar of SS about which there has been so much discussion. The form has remained unchanged, save that the badge is the badge for the time being of the Sovereign. The heralds have their collars of SS of silver, whilst those of a King of Arms are of silver gilt, and the latter have the further distinction that a portcullis is introduced on each shoulder. The heralds and Kings of Arms usually place these collars round their shields in representations of their arms. Collars of SS are also worn by Serjeants-at-Arms, and by the Lord Chief Justice. FIG. 19.--Peace proclaimed at the Royal Exchange after the Crimean War. The English Heralds have no equivalent badge to that which the Scottish Heralds wear suspended from their necks by a ribbon. In Ireland both Heralds and Pursuivants wear a badge. In addition each King of Arms has his crown; the only occasion, however, upon which this is worn being at the ceremony of a coronation. The crown is of silver gilt, formed of a circle upon which is inscribed part of the first verse of the 51st Psalm, viz. "Miserere mei Deus secundum magnam misericordiam tuam": the rim is surmounted of sixteen leaves, in shape resembling the oak-leaf, every alternate one being somewhat higher than the remainder. Nine of these leaves are shown in a representation of it. The cap is of crimson satin, closed at the top by a gold tassel, and turned up with ermine. FIG. 20.--A French Herald of the early part of the fifteenth century. Garter King of Arms has a baton or "sceptre" of silver gilt, about two feet in length, the top being of gold, of four sides of equal height, but of unequal breadth. On the two larger sides are the arms of St. George impaling the Sovereign's, and on the two lesser sides the arms of St. George surrounded by the Garter and motto, the whole ensigned with an Imperial crown. This "sceptre" has sometimes been placed in bend behind the arms of Garter King. Lyon King of Arms has a baton of blue enamel with gold extremities, the baton being powdered with roses, thistles, and fleurs-de-lis. Lyon (Sir James Balfour Paul) in his "Heraldry in relation to Scottish History and Art," remarks that this is one of the few pieces of British official regalia which is still adorned with the ancient ensigns of France. But knowing how strictly all official regalia in England is required to have the armorial devices thereupon changed, as the Royal arms and badges change, there can be very little doubt that the appearance of the fleur-de-lis in this case is due to an oversight. The baton happens to be that of a former Lyon King of Arms, which really should long since have been discarded and a new one substituted. Two batons are usually placed in saltire behind the arms of Lyon King of Arms. Ulster King of Arms has a staff of office which, however, really belongs to his office as Knight Attendant on the Most Illustrious Order of St. Patrick. The Scottish Heralds each have a rod of ebony tipped with ivory, which has been sometimes stated to be a rod of office. This, however, is not the case, and the explanation of their possession of it is very simple. They are constantly called upon by virtue of their office to make from the Market Cross in Edinburgh the Royal Proclamations. Now these Proclamations are read from printed copies which in size of type and paper are always of the nature of a poster. The Herald would naturally find some difficulty in holding up a large piece of paper of this size on a windy day, in such a manner that it was easy to read from; consequently he winds it round his ebony staff, slowly unwinding it all the time as he reads. Garter King of Arms, Lyon King of Arms, and Ulster King of Arms all possess badges of their offices which they wear about their necks. The badge of Garter is of gold, having on both sides the arms of St. George, impaled with those of the Sovereign, within the Garter and motto, enamelled in their proper colours, and ensigned with the Royal crown. The badge of Lyon King of Arms is oval, and is worn suspended by a broad green ribbon. The badge proper consists on the obverse of the effigy of St. Andrew bearing his cross before him, with a thistle beneath, all enamelled in the proper colours on an azure ground. The reverse contains the arms of Scotland, having in the lower parts of the badge a thistle, as on the other side; the whole surmounted with the Imperial crown. The badge of "Ulster" is of gold, containing on one side the cross of St. Patrick, or, as it is described in the statutes, "The cross gules of the Order upon a field argent, impaled with the arms of the Realm of Ireland," and both encircled with the motto, "Quis Separabit," and the date of the institution of the Order, MDCCLXXXIII. The reserve exhibits the arms of the office of Ulster, viz. : "Or, a cross gules, on a chief of the last a lion of England between a harp and portcullis, all of the first," placed on a ground of green enamel, surrounded by a gold border with shamrocks, surmounted by an Imperial crown, and suspended by a sky-blue riband from the neck. The arms of the Corporation of the College of Arms are: Argent, a cross gules between four doves, the dexter wing of each expanded and inverted azure. Crest: on a ducal coronet or, a dove rising azure. Supporters: two lions rampant guardant argent, ducally gorged or. Garter King of Arms.--Argent, a cross gules, on a chief azure, a ducal coronet encircled with a garter, between a lion passant guardant on the dexter and a fleur-de-lis on the sinister all or. Clarenceux King of Arms.--Argent, a cross gules, on a chief of the second a lion passant guardant or, crowned of the last. Norroy King of Arms.--Argent, a cross gules, on a chief of the second a lion passant guardant crowned of the first, between a fleur-de-lis on the dexter and a key on the sinister of the last. Lancaster.--The red rose of Lancaster ensigned by the Royal crown. York.--The white rose of York en soleil ensigned by the Royal crown. Richmond.--The red rose of Lancaster impaled with the white rose en soleil of York, the whole ensigned with the Royal crown. Windsor.--Rays of the sun issuing from clouds. The four Pursuivants make use of the badges from which they derive their titles. The official arms of Lyon King of Arms and of Lyon Office are the same, namely: Argent, a lion sejant full-faced gules, holding in the dexter paw a thistle slipped vert and in the sinister a shield of the second; on a chief azure, a St. Andrew's cross of the field. There are no official arms for Ulster's Office, that office, unlike the College of Arms, not being a corporate body, but the official arms of Ulster King of Arms are: Or, a cross gules, on a chief of the last a lion passant guardant between a harp and a portcullis all of the field.